A reader sent us this e-Bay listing, http://ebay.to/1tf0Kwt, asking our opinion. Just like on the popular tv shows! 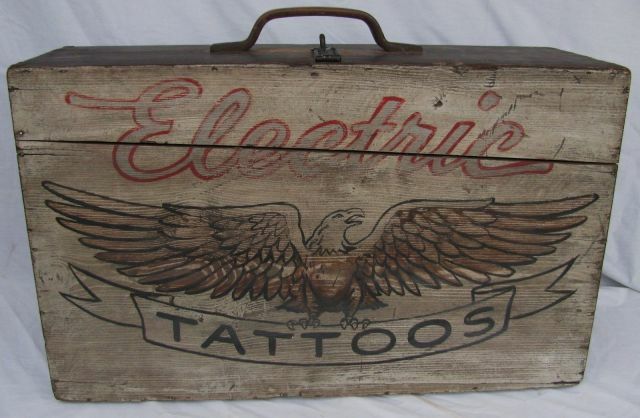 It looks like an itinerant tattoo artist case. These are rare and quite beautiful. Let’s look at this one. The box is indeed quite old. 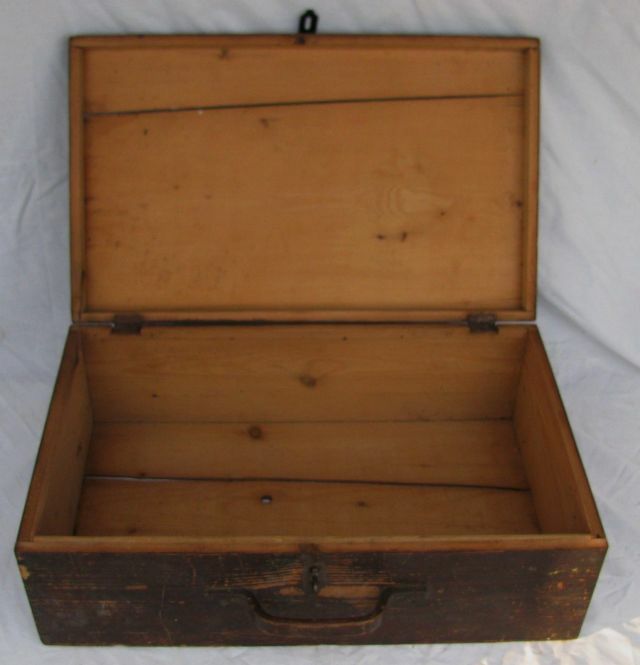 The dry white paint is great, the wood, clasp and hinges are turn of century or older. Unfortunately we don’t believe it was ever employed by a tattoo artist. The interior shot gives it away. Where are the partitions to separate drawings from the tattoo machines? There would be partitions to separate the tattoo flash, notebooks and stencils from the business end of tattooing. The inside of the box is just way too clean. Where are all the spilled ink blobs, splatters, drips and circle spots where the bottles would sit, the smudges from black chalk or graphite? We don’t see any of the scrapes or nicks from the assorted crap flying around as stuff would when riding the rails, jumping from tramp steamers to port or just traveling from town to town on the carnival circuit. Working the small town county fairs would rattle the insides of a tattoo artists box. Now, let’s look at the lettering. The word “Electric” in script looks like it’s borrowed from a 1950’s Eletrolux vacuum cleaner. An era at least 50 years newer than the actual box. The eagle is horribly drawn with a fat mutant bird head. It has no relation at all to the way a tattooist would render this traditional symbol. The wear and distress marks on the lettering are clearly bogus. For example why is it worn somewhat in the center of the lettering and not over the eagle? Why are the wing tips not showing any wear from handling? Where there is money, fakes will follow and the folk art field is boiling over with reproductions. Tattoo art is now in the forgers cross hairs especially with high dollar ($28k) auction records like Coleman’s Battleship Kate at Skinner’s. Which was clearly the real McCoy. Looking at other listings from this dealer it turns out he’s the same guy who scissored up a full sheet of Oklahoma Bob’s tattoo flash into 10 small sheets framed up in a heartless money grab. More items equal more profit goes the thinking here. In the spirit of equal time and fairness we tried reaching the “olegolfguy” (eBay moniker) for his view. His eBay listings are blocked and do not allow any questions. We’d probably want to lay low also. This entry was posted in Uncategorized and tagged Antiques, Ebay, Fake Antiques, Folk Art, Forgery, Scams, Tattoo, Tattoo Art. Bookmark the permalink.